So I might extrapolate that a login screen is kinda dumb for Haiku? So, Haiku needs to remain uncluttered and undetered from its original destination - even though we all want Haiku to be this or be that? Is this basically what you’re saying? If so, that’s a really good point. And this question has come up so many times before on these forums! Basically, yes. I do think there’s room for improvement in making it better at being what it was intended to be (a login screen can be a useful thing, though it should definitely be optional,) but trying to turn it into something wildly different just because that’s what’s trendy at the moment is a bad direction. How does one get this up and running? Does it need to be compiled first? 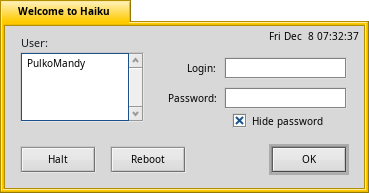 I like the simple one from OP’s post, just login GUI in classic Haiku style. Needs some work to make it look really nice. As for me - that already look nice. “User:” also needed for clarity. Good idea, it can be in the right (or left) of the date (in my picture). …I would add also icon for switching keymap. I would go with a more generic solution and allow replicants to be docked to the lock screen. So you can put PowerStatus there, but also a clock, your unread e-mail count, Weather, and whatever you want to have an eye on easily even when the computer is locked. … and battery status can be placed on the left of the date entry (it is actualy not a creep, I think, good to know when you battery is nearly empty, and instead of loging you get shutdown). … eh, and where is “Shutdown” button!? if some one use more than one keymap and one of it is not with latin characters you in trouble! if you last used keymap before your screen logof was not with those characters witch are in your login and password. 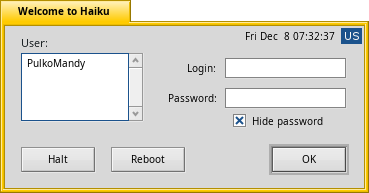 You can not log in your system any more, because Haiku remembers last used keymap and uses it as default. Also you can accidently swich to foreign keymap before you system go logof. I have tried to create a login screen in yab foryears. I never get an solution to make deactive the keys strg+alt+del, so every one can close the login screen without entering a password. I have tried to change the keymap before but this takes no effect. Maybe Screensavers Passwords Lock sources can help you. By the way, if this Password Lock be able run at start system and lock it, that would be login into the system. I must add: even with not working ctrl+alt+del you can hard reset system and disable the “lock password screensaver”, after system reboot you will have full access to Haiku desktop. And if you do not have installed keymap switcher you in trouble if you tried some not usual for you keymap and locked screen – for you only reset the way then. Yeah, I figured something like that. Might be neater to have tray items though, otherwise they can just look like part of the background. Have to be careful with allowing any replicant as well… in case it allows you to start applications without logging in or something. Anyway, I just find it annoying when a display manager doesn’t show battery status. Are we beginning to see why security must be created from the ground up? Trying to retrofit security in afterwards is very difficult!